Hey friends! It has been a long time hasn’t it?! Sorry about that. Seems that having four children can actually make one quite busy. Who knew?So during my time off, I have been crazy busy working on foods that my family and I would enjoy, gluten free, xanthan gum free… junk free and chemical free as much as possible. I have tried many substitutions with gluten free flour and have failed pretty well many times, especially in the baking area. (Though I did bring one pinterest fail to a party with college friends and well, it didn’t look fabulous, but it tasted yummy!) One thing I do have to say in that regard, most baked items need that fluff that comes from the addition of xanthan gum or guar gum. Xanthan is apparently used in many gluten free baking substitutes because guar is prohibitive in cost, as I suspected. I have yet to goof around with combinations of baking powder or baking soda to a gluten free all purpose blend of flours. For now, I am still working primarily flour free. 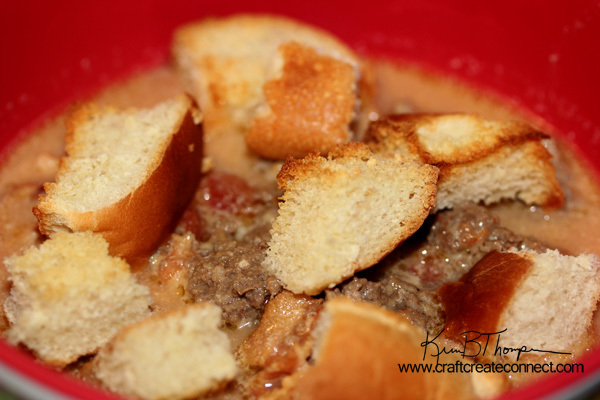 That being said, my friend Brandie over at Homecooking Memories, recently posted this bacon cheeseburger soup recipe on her Facebook page. With a quick scan of ingredients, I thought… hey! I can eat that! So this past weekend, as the cold set in and fall disappeared into winter, I busted out my soup pot and made a lovely batch. I have to be honest, it felt seriously weird to add pickles into a soup. I thought that my hubby would no way ever eat them, or the chunks of tomato but you know what? He totally did and he totally loved it. The flavors blended beautifully in my mouth and it was a delicious treat, even without the hamburger bun croutons. I am sure you could make gluten free bread croutons similarly and they too would be a delicious addition. Even my non-soup eating kiddos liked this one! Hope you give this recipe a try and let me know what you think! Also, be sure to pop over to Shugary Treats and Homecooking Memories! Lots of yummy stuff on them!